A herniated disc occurs when the outer portion of a spinal disc breaks down and the inner potion leaks out.The inner portion of the disc that extrudes can then irritate or compress nearby nerves, causing radiating pain. A spinal disc acts as a shock absorber between the vertebrae of the spine, and allows for movement in the spine. The durable outer portion of a disc, called the annulus fibrosus, serves to contain the soft inner portion of the disc, the nucleus pulposus. 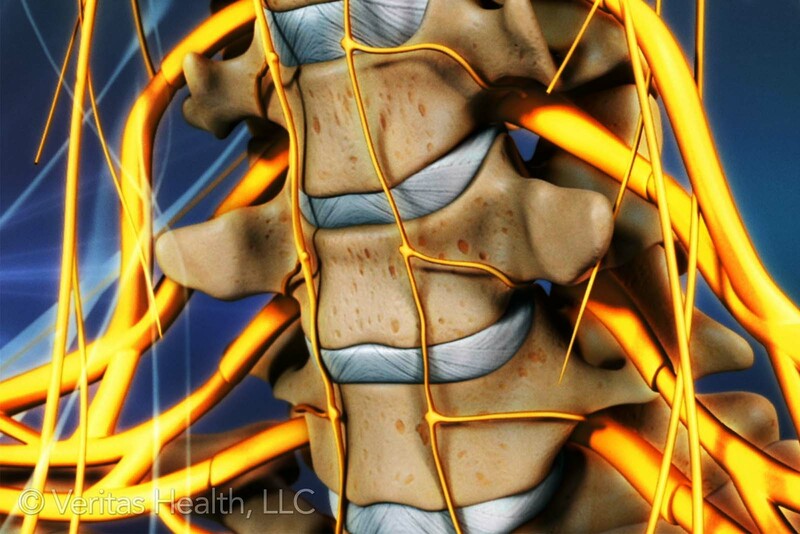 The majority of herniated discs occur in the lumbar region of the spine. Any contact between the nerves and inflammatory proteins present in the disc’s nucleus, or pressure from the disc itself on nerves in the lower spine can result in pain, numbness, tingling or weakness radiating down the leg. These symptoms are called sciatica or lumbar radiculopathy. When a herniated disc occurs in the cervical region of the spine, it can cause pain to radiate down the shoulder into the arm and fingers, as well as neurological symptoms. A herniated disc is relatively rare in the thoracic region of the spine. When it does occur, pain is commonly felt in the upper back, and sometimes radiates into the chest and belly. If a cervical or thoracic disc herniates into the spinal cord area, it can cause myelopathy or spinal cord dysfunction. Symptoms include numbness, loss of balance, lower extremity weakness, and loss of bladder control. A herniated disc can cause a variety of painful neurological symptoms. It is important to understand the underlying cause of these symptoms in order to effectively treat a herniated disc.